Earlier in the year I re-read Peopleware and I finally got around to comparing my notes with Hamish’s. Today my third IBM PC Convertible arrived from the US. Third? Yes, I picked up a basic unit over a year ago and then six months ago I picked up one with the printer slice. So, even if I can’t get this one working – it was listed as not working – it does give me more of the options. Also, flicking through the manual is interesting as it gives information on options such as the printer even though the unit may have not included it. 20 months ago I purchased a stand for my 24″ display but didn’t end up using it. For 9 months it has sat on my floor and before that it was being used by a friend on a 17″ display. When I got the 24″ display I moved my old 19″ CRT (with scratches all over the surface) to my mum’s computer. Today I finally got around to replacing that with a nice Samsung 19″ LCD, but after setting it up I found that the stock stand was pretty hopeless. Yes! A use for that stand. While writing this post I discovered that it is two years to the day since I started this whole saga by getting the Dell display. It is still going strong. 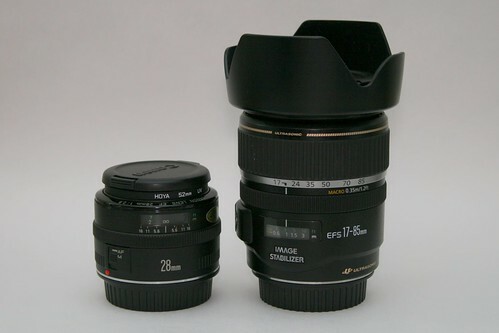 The kit lens from my digital SLR is a Canon 18-55mm lens. As well as the quality not being the best (I am far from alone in that opinion) it doesn’t have the zoom range that I want for a general purpose walk-around lens. A few weeks ago I went into Luna Park with David to take some photos. For this I borrowed Hamish’s Canon 28-90mm lens (that he has since sold) and the extra length was good. However 28mm just wasn’t wide enough. Last week I went to the Steamrail open weekend (repeating last year with a better camera) and this time I took along Hamish’s Sigma 18-125mm lens (that he has has his main lens). Although this is both longer and shorter than the 28-90mm, it is the shorter length that I used the most. From a number of options I has narrowed down my choice to the Canon 17-85mm IS lens and for the past two weeks I have been monitoring eBay. After bidding on a few listings, last night I was the winning bidder for the lens, a hood and two UV filters for half what they would all cost new and consistent with the final price of other listings. Fortunately the seller (from the other side of the city) was coming my way and they delivered it today. This difference means that the case I got a few weeks ago is now not big enough for this lens, and it is a bit too big if I have the 28mm on. Maybe I should have got a slightly smaller bag for when I will just have the 28mm (such as the upcoming Pub Standards meeting) and a bigger bag to take the camera with 17-85mm attached and the 28mm in a pocket. That photo above of the two lenses was taken against some off-white paper (slightly larger than A3) curved up against the wall and with a business card to bounce the flash off the (white) ceiling. So it didn’t look dull I had to adjust the fill light in Picasa which resulted in it being a bit grainy. That is why I need to make a lightbox. Decent external lights (flash or floodlights), the camera on a tripid and controlling it via software would be a massive improvement. Due to venue issues, there was no Melbourne Perl Mongers last night. Instead there was a ‘Pub Mongers’, sort of the same thing except entirely at the pub with no planned talks. Pub Mongers (March 2008) – a photoset on Flickr. One other change is that I didn’t bother taking my laptop along as the most I have used it for at a meeting for a long time is making a note of something to look up later. What I did take along was my good camera. I only took along the kit 18-55mm lens (instead of the 28mm F2.8 lens I also have) as I still haven’t got a better walkaround lens (looking at a EF-S 17-85mm IS lens on eBay). This still gave me some experience in pretty bad light so hopefully things will only improve. Continuing my plan on going to as many community events as I can I should be repeating this next week at Pub Standards Melbourne.